"If you were a casino game, you'd have the best odds." 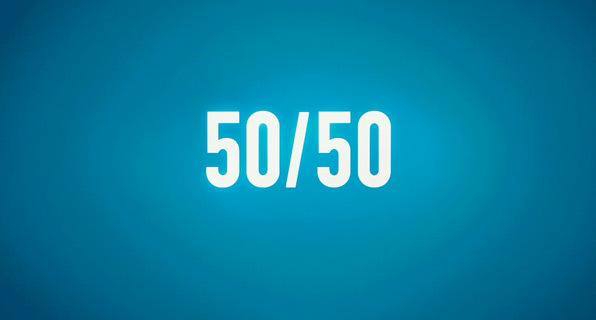 Summit has debuted the first official trailer on Apple for 50/50, a comedy formerly titled I'm With Cancer, written by cancer survivor Will Reiser, directed by Jonathan Levine of The Wackness. Inspired by personal experiences, 50/50 is an original story about friendship, love, survival and finding humor in unlikely places. Joseph Gordon-Levitt and Seth Rogen star as best friends whose lives are changed by a cancer diagnosis. Rogen also serves as producer, along with Evan Goldberg and Ben Karlin. This really looks funny and heartwarming all at the same time, check it out! Can't wait, I really like this pairing. That was fantastic! I'm extremely excited about the Gordon-Levitt/Rogen pairing...I'm there for sure! @ Ricardo, indeed. I have a feeling there will be a lot of memorable one liners. I loved The Wackness, and I'm definitely looking forward to this! I liked the Wackness too grim, this looks great! Can't wait to see these this movie! I go in on June 9th for a biopsy to see if I have cancer. I think this movie means I do hahaha. But that aside I am extremely excited for this movie. Anything with JGL is gold!!! Good luck to you, here's hoping you are cancer free. Joseph Gordon-Levitt is an incredible actor. He doesn't have to scream and yell like Pacino or be stone cold calm like Dinero. He's somewhere in the middle, and it's brilliant. This movie looks like a great role for him. I'll see this for sure. I was about to say the same thing. Not that I don't like Pacino or Deniro. I respect different acting styles, from reason I like his the best out of any actor today! I'm with you. Love Pacino and Deniro...Just enjoying JGL much more now-a-days. I would recommend watching him in Hesher. I actually didn't enjoy that movie, but he's anything but boring in it. "The Lookout" wasn't bad either. I'm going to see Hesher tomorrow. Saw Brick and Lookout...decent movies. He was mediocre in them. However that didnt distract from the story of the films. I respectfully disagree about his performance in "Brick" he played a perfect noir detective. Holy God that looks good...cannot wait for this. JoGo is the man and he plays surprisingly well, from the look of it, off Seth Green (of all people). Thanks for posting Alex...Oh, and welcome back from Cannes! Seth Rogen.... If it was Seth Green I wouldn't see it no matter what lol. Looks good, looks great actually, I'll totally see this. Alex, didnt he act the same exact way in 500 days of Summer? I will definitely see this film! Hmm.. the trailer tries to sell this as a dramedy, but if it's gonna be anything like The Wackness then it will be really depressing. I think we'll get another Funny People here.. Spoiler, but yes.. I thought the movie was still very melancholic.. I can't stand Joseph Gordon-Levitt. He is a horrible and overacted actor. I got all excited by the opening music. Menomena is a great band. Anna Kendrick is busy. This doesn't look like anything I'd want to see. I just love Anna Kendrick...so damn cute! Does anybody know what type of cancer he gets?